Home New Features / Previews Scroll Crafting! New Character Customization Feature: Crafted Spell Scrolls! We have decided to add an additional way to customize your characters within the game to provide additional replay options. Previously we introduced Orb crafting to allow you to create specialized orbs with various beneficial effects (or just simply cosmetic). This time we’ve decided to expand a bit more on that crafting system to allow you to craft scrolls of existing character spells and allow you to slot those scrolls onto other characters letting them also learn the same spells! This opens up a whole world of options for players between both the orbs and scrolls as to how they wish to have each character play out within their adventures. In addition to crafting scrolls, during your adventuring there will be many times you will receive randomly generated loot which can contain any of these scrolls! Keep a look out for them! Every time you kill a monster you are given an amount of Residuum based upon how challenging that battle was. When crafting, you use this Residuum as a chemical reactive in your alchemy to produce the desired orbs/scrolls. We decided to remove all “risk” from trying out scrolls (and orbs); thus there is no “loss” when you decide you don’t want, or no longer need a scroll/orb. When you “dismantle” a scroll/orb, the entire Residuum value of that scroll/orb will be returned to you for future crafting! A character can only create scrolls of spells they’ve naturally learned (through levels). They cannot craft additional scrolls from spells they only know when having a scroll slotted of that spell. Characters may not be able to create scrolls from all their spells right away. Some spells will be treated more special than others and may require that character to be at a higher level before they can be allowed to craft scrolls of that spell. Once a scroll is created, you can slot it to other characters using the same slot system used by orbs. You also get an entirely separate set of slots just for the scrolls! As with Orbs, each character will have a different amount of available slots and will typically increase as they level up. All available scrolls will be listed, however only those within the character’s level will be enabled for selection. To equip a scroll, simply select an available scroll from the list on the right and drag it onto any of the slots on the left. If a slot previously contained another scroll, the old one will be returned to the inventory and the new one will simply replace it within the slot (does not destroy). There are various “Types” of scrolls (eventually). Clicking on any slot with a scroll within it will filter the list on the left by only that type allowing you to see the others like it. 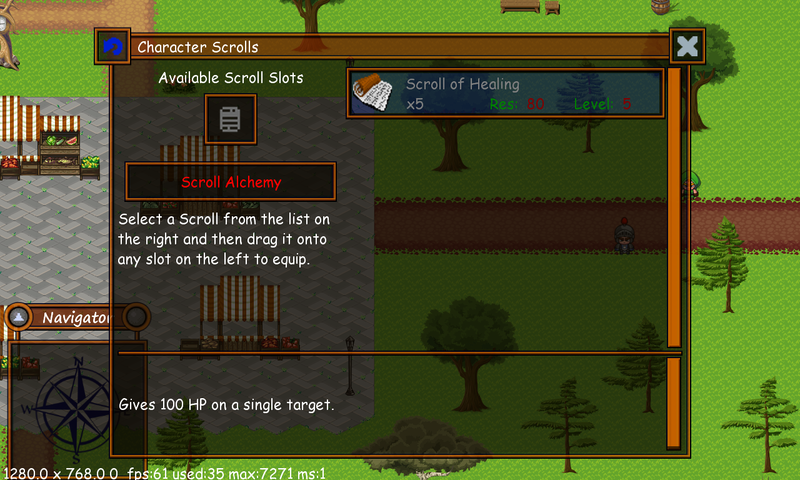 If you wish to use Alchemy to craft additional scrolls from spells the current character naturally knows, click on the “Scroll Alchemy” button and you will be taken to that screen. 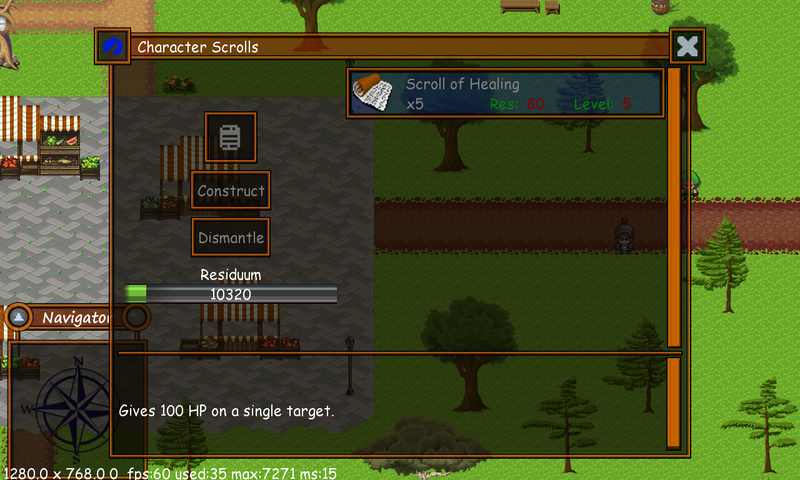 This screen allows you to craft scrolls from any naturally known spells of the current character. Only the scrolls of spells that the character naturally knows will be listed here. If the scroll is higher level than that of the character they will not be able to craft it (yet). Once they reach that level however, the scroll will be available for crafting. Drag any available scroll from the list on the right onto the crafting slot. Click on the “Construct” button and a new scroll will be created! The cost of the scroll will be deducted from your available Residuum. Click on the “Dismantle” button and the number of scrolls in your inventory will be reduced by one. Additional clicks will continue to reduce the count until you reach zero. As mentioned above, the full Residuum value of the scroll will be returned to you. We’re pretty excited about this new feature and look forward to see how players will use the scrolls and orbs to customize their characters during adventures. So is the Residuum value is a second form of XP, or are you going to use it to control inventory as it is a limited resource? Or both? The initial plan is that it is a “shared” value (like gold) and is incremented for the party instead of each character having their own amount. Think of it more like an ingredient and the container holding it is tracked through the bar to make it easier visually. You would then consume it like an ingredient when you decide to craft things. Visually, I could consider making it a “jar” that fills up to make it feel more like an ingredient. I could also consider letting you buy additional “jars” to hold more if you want to; but that’s likely something to consider later.